Sonic 3 + Sonic & Knuckles "Boss Guide"
ACT 1: FIRST RING "GATE"
I tend to call these gates, since they lead to the bonus levels (where you get a chance to earn an emerald). The very first one is right below the starting point. Just go right, jump over some spikes and drop down. From there, go left (you'll need to spin dash through some grey rocks). No matter which character you're using, you'll meet this menace at the end of Act 1. Grabbing a Fire Shield makes this a -lot- easier. You must hit this floating flamethrower 8 times to defeat it. 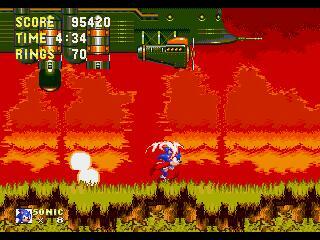 KNUCKLES: In addition to the flame, this boss will shoot bombs (out of those pipe-like chambers on the top). 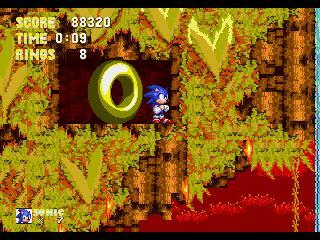 ACT 2: FIRST RING "GATE"
Just race to the right, over a collapsing bit of ground, to reach this large ring. 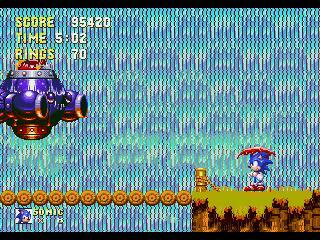 Watch out for those bombs (especially if you're playing as Tails--I wait for the first round of bombs, then fly up into the bomber & hide) as you race toward the boss at the end of Act 2. 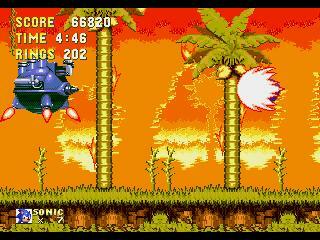 Robotnik will burn the bridge when he first comes out, so be careful not to fall! Then he'll pop in and out of the waterfall. His attacks are big, yellow fireballs which he'll either shoot across or down. Time your attacks so you don't land on one on the way down. KNUCKLES: He takes a different route, but still reaches this spot. 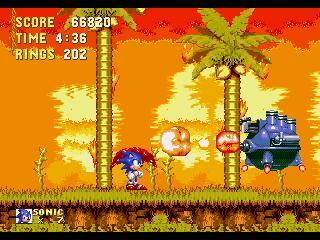 Instead of Robotnik, it's one of the Eggbots that's flying the machine.